GitHub - derkreature/IBLBaker: Light probe generation and BRDF authoring for physically based shading. Light probe generation and BRDF authoring for physically based shading. Want to be notified of new releases in derkreature/IBLBaker? IBLBaker is provided under the MIT License(MIT) Copyright(c) 2015 Matt Davidson. Please see the LICENSE file for full details. This project makes heavy use of subprojects. Downloading the .zip from github is an insufficient method for acquiring the source for all dependencies. Please checkout the repository through git in order to acquire all required dependencies. 1.) Run "IblBaker.bat" in the source root directory. This will run CMake and automatically setup all dependencies. IblBaker.bat automatically configures for Visual Studio 2015 x64 and builds with the community edition. You should not need to change any of the CMake config options. 2.) The output of IblBaker.bat is "Build64" in the root directory. 4.) Set startup project to IBLBaker. There is no elegant way to do this in CMake. The IBLBaker grew out of a quick implementation of the Siggraph Unreal presentations on Physically Based Rendering that I put together for a presentation on OpenSubDiv during late 2013. The main reason that it is here is to provide a concise example of all the parts required to realtime evaluate light probes for physically based rendering. While this is not a complete implementation of the required rendering pipeline (I have omitted cavity, bloom, reflection occlusion and realtime ambient occlusion and IBL shadowing (Kreature does these, but I felt that they detracted from the core exercise), it should serve anyone looking to implement dynamic probes in good stead. (If it doesn't, email me, and I will rectify the problem). At the very least it can be used for baking diffuse irradiance and specular pre-convolved environment cubemaps evaluated over roughness over mips computed using a user specified brdf. The baker uses importance sampling to evaluate the environment maps and visualize the results using the separable method proposed by Epic Games at Siggraph 2013. The tool allows the user to save the computed environment maps and the BRDF Lut to disk for use in other pipelines. I have provided example cgfx shaders for maya viewport 2.0 in the /maya directory with 2 example scenes in .ma format. A Special thanks must be given to Munkyfun (www.munkyfun.com) who sponsored much of the work in preparing this work for an open source release. Thank you so very much guys! Thank you also to www.gametextures.com for allowing the use and publication of their "Brown Brick" PBR texture set. I will be releasing this set along with a revised shader ball in the near future. I'm not a huge fan of git subprojects, and I'm also not a fan of having to track down all of the dependencies for a project in order for it to build. I recently reenabled AssImp and FreeImage in the default build. For these reasons the repository has grown by a couple of hundred mb. This codebase is based on an old version (circa 2009) of my personal research framework. It was developed more as an exercise to learn new techniques, so parts of it are fundamentally flawed. One particular area is the use of abstract base types for render API abstraction. This is clearly a bad idea, and will go away before I release. Mainly, I don't want anyone to ever think that this is a good idea. If a class has an "I" in front of it, or D3D11 at the end, please hold your nose and ignore for the moment :). I am holding off on pulling from my current framework(Kreature) until I have implemented Vulkan. CmftStudio - A similar open-source project. Marmoset Skyshop - Commercial plugin for Unity3D Game engine. Knald Lys - Commercial tool from KnaldTech. D3D11Effects has some serious issues. I will be replacing this in the near future in any case. (Post D3D12/Vulkan in Kreature). Shutdown leaks abound after the latest GUI port. I've been in a bit of a hurry, so, uhhh, please forgive. What about linux / osx / iris / bsd / ios / nextstep / rasberry pi / abacus support? The rendering layer is platform agnostic in principle. For the moment only the D3D11 layer has been implemented. The application layer started out with the best intentions of being agnostic. It unfortunately now requires some work to port from Windows to other platforms. I am working on an OpenGL 4.0 implementation for OSX and Linux at the moment. Upon starting you should see a pistol surrounded by the input probe environment mapped to sphere. Mouse move will orbit the camera. Left Control key down + mouse move will rotate the visualized object. W and S keys zoom the camera in and out from the origin. Mouse scroll zooms the camera in and out from the origin. "Load Environment" Button New maps can be set by click on the "Import Environment" button. Valid input environments are .dds by default. It is probably better that they are setup as RGBA16F or RGBA32F. Maps can be Lat / Long / equirectangular and cubemap layouts. While only the DDS codec is enabled by default, it is possible to enable the FreeImage code by adding a project define "#if IBL_USE_ASS_IMP_AND_FREEIMAGE = 1". You will have to provide your own builds of FreeImage and AssImp. The reference codec based on Ogre is in src/codecs/IBLFreeImage.cpp/IBLFreeImage.h. Prior warning if you are building static libraries, both AssImp and FreeImage depend on Zlib. Environments can be saved by clicking on the "Save Environment" button. You must specify a .dds filename to export to. A number of files will be saved using the specified .dds filename. I recommend installing the nvidia photoshop dds plugin to view the mips of the saved cube maps. "Compute" Button The compute button forces invalidation of the IBLProbe and causes the probe to be resampled. "Cancel" Button The cancel button forces the IBLProbe to be marked valid and no further computation will take place until either a dependency to the probe is altered or "Compute" is clicked on. Exposure: Exposure parameters for tone mapping. Gamma: Output gamma for color correction. Input Gamma: The color space of the input environment map. 1.0 for linear. No Debug: Renders the object lit. Normal: World space normals. Ambient Occlusion: The blue channel from the RMAOC specular map that contains the ambient occlusion. Albedo: The albedo map for the object. IBL Diffuse: The diffuse irradiance contribution from the environment. 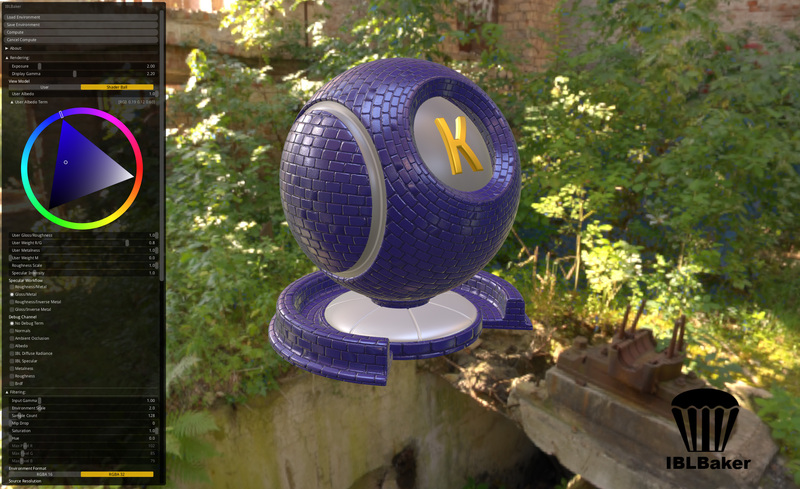 IBL Specular: The environment map value sample using reflection vector and the mip layer using the roughness value in the specular map. Metal: The green channel from the RMAOC specular map. Roughness: The red channel from the RMAOC specular map. BRDF: The computed bias/scale terms from the BRDF Lut using ndotv and roughness. 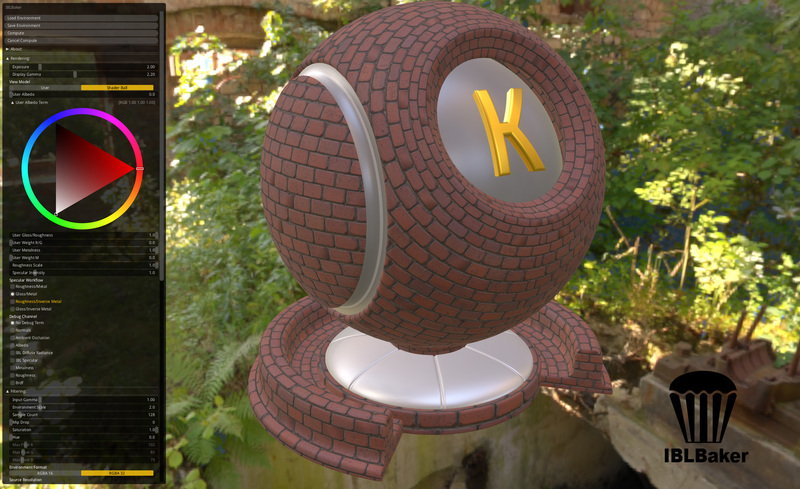 Specular Workflow: Inverts roughness and/or metalness terms for the visualized object. Specular Intensity:A multiplier to the material specular term for the visualized object. Roughness Gloss Scale: An inverse multiplier to the roughness term for the visualized object. BRDF: The brdf that is current being used to evaluate the IBLProbe and render the object. BRDFs can be found in data/shadersD3D11 in .brdf files. These files are hlsl that are concatenated with the core shaders IblImportanceSamplingDiffuse.hlsl, IblImportanceSamplingSpecular.hlsl and IblBrdf.hlsl. You can create new .brdf files to experiment. .brdf files are loaded on application startup and are enumerated automatically. You may edit shaders while the application is running and they will be automatically reloaded. There is no runtime guard around shader failure. If you write an invalid shader the application will crash. Failures are written data/ShadersD3D11/ShaderFailures with the error and warning list at the end of the file. Diffuse Resolution: The per face dimensions of the diffuse cube map. Specular Resolution: The per face dimensions of the specular cube map. A full mip chain will be created for the cubemap. Mip Drop: The number of mips above the 1x1 face in the specular cube map to ignore when computing roughness convolutions. Total Samples: The number of samples to use per pixel when importance sampling. Samples per frame: The number of samples that are computed per update of the IBL Probe. If the samples per frame != total samples, the IBL Probe will be progressively sampled. This functionality is still experimental and has some bugs. For the moment, please ensure that the total samples / number of samples per frame is a positive whole number. Environment Scale: A scale term applied to every sample when importance sampling. IBL Saturation: A saturation term applied to every sample when importance sampling. IBL Contrast: Incomplete. A contrast term applied to every sample when importance sampling. I still need to write some code to make this work correctly. IBL Hue: A hue term applied to every sample when importance sampling. Max R/G/B: A debug attribute that displays the maximum pixel value in the input environment image. How does the tool work (a broad overview)? 1.) Starting at Application::updateApplciation() in Application.cpp. _scene->update() is called which updates all of the IBLProbes and BRDFs. At this stage the BRDF lut is computed in Brdf::compute() using the compute shader in data/shaders/IBLBRDF.hlsl which is concatenated with the current .brdf file (which can be found in data/shaders/). - Projects the sphere geometry of the scene to a 2048x2048 cubemap using the geometry shader that we will nominate the "environment source". It would also be possible to render a scene using this technique to an environment map. The shader for this operation can be found under: data/ShadersD3D11/IBLEnvironmentSphereSpherical.fx. - Mip maps are generated for the environment source. - The diffuse irradiance environment map is computed by projecting a sphere using a geometry shader over the diffuse irradiance environment map and importance sampling per pixel using the source environment with the shader data/ShadersD3D11/IBLImportanceSamplingDiffuse.fx concatenated with the current .brdf file. - The specular environment map is computed by rendering to each mip of an environment map with an associated roughness term by projecting a sphere using a geometry shader over the specular environment map mip level and importance sampling per pixel using the source environment with the shader data/ShadersD3D11/IBLImportanceSamplingSpecular.fx concatenated with the current .brdf file. 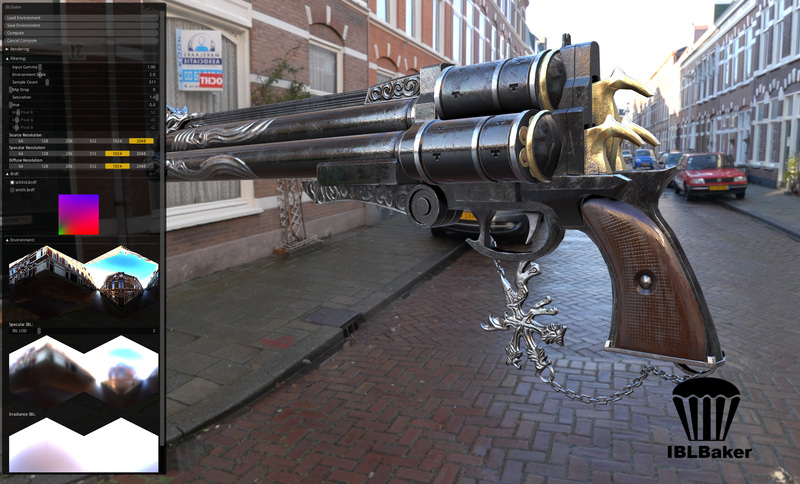 - The pistol is rendered using the shader IblPBRDebug.fx . The inputs to this shader are the diffuse irradiance environment map, the specular roughness environment map, the brdf LUT, the object albedo map, the specular map and a normal map. How does the tool work (a more detailed overview)? Compute roughness (0 to 1.0) based on pixel x coordinate. Compute normal dot view (NoV) (0 to 1.0) based on pixel y coordinate. Integrate number of importance samples for (roughness and NoV). Convert Hammersley to world space coordinate based on roughness. The following functions are implemented in the .brdf file. Compute the fresnel term given VoH. Sum the result given fresnel, geoemtry, visibility. Average result over number of samples. Given a sphere mesh input centered at the world origin. Transform vertex position to the world. Transform the world position to 6 faces of a cubemap. Set View (V) = Normal (N). Compute the sample step as MaxSamples / SampleCountPerFrame. sampleStartId = sample offset (current offset in all samples). H = Convert the Hammersely coordinate to a world coordinate H.
Mip map (lod) = compute the mip map using the solid angle, source map size, distortion and the pdf. Sample = Cubemap sample at coordinate H and mip map level lod. Sum the Sample to Result.xyz and Sum weight to Result.w. Increment the sampleId by the by the sample step. Result = Divide Result.xyz by accumulated weight in Result.w. Given a sphere mesh input centered at the world origin and a mip map target that will be sampled using Roughness (0 to 1.0 over all mips, where mip=0 represents roughness 0 and mip = (NumMips-1) = 1.0. Set View (R) = Normal (R) = R = world vertex normal. H = Convert the Hammersely coordinate to a world coordinate H given Roughness. Sample = Cubemap sample at coordinate L and mip map level lod. What would you like my input on? that I do not have a close working relationship within the industry. 3.) The validity of my method for progressive sampling using importance sampling and where I have gone wrong (if possible). Am I taking contributions? Yes, please. I would be happy to merge any changes you suggest into the release if they do not conflict with your employment situation and will not endanger the project's ability to be released publicly. How far away am I from a public release? This depends on whether my math is bunk or not. I still need to fix some memory leaks and perform one final pass on the codebase so that it is clean/er. I hope to have the library available to the general public by the end of August / start of September. The author of this icon will be grateful if you use the following legal attribution "Icon made by Freepik from Flaticon.com"